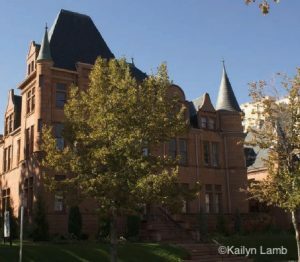 Kailyn Lamb, author of Ghosthunting Colorado investigated reports about paranormal activities going on at the Oxford Hotel. Here is what she found out. 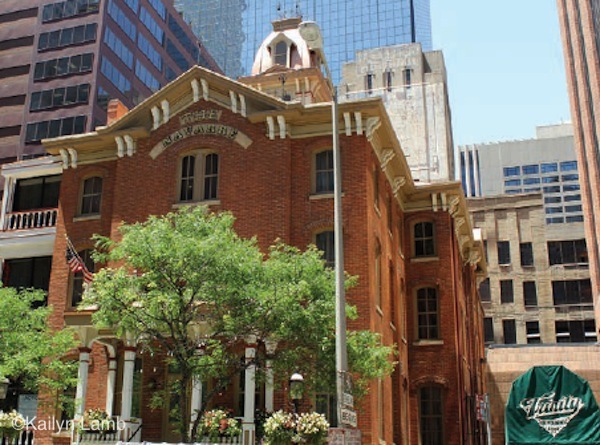 As the oldest hotel in Denver, the Oxford Hotel’s history is rooted in luxury. Built in 1891 during the peak of the silver rush, the hotel was fitted with gas heating and an elevator and even had its own power plant to enable these luxuries. 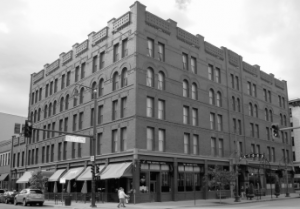 The building was designed by Frank E. Edbrooke, who, coincidentally, designed the Brown Palace, Denver’s second oldest hotel and the Oxford’s prime competition for the most haunted hotel in Denver. 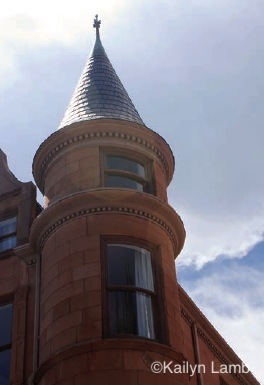 The hotel is five stories high and contains several reputedly haunted locations. One of the first haunted locations presents a little bit of a novelty. Located off the main lobby and down some stairs on a lower floor is a women’s restroom, but when the hotel was originally built, this area was the barbershop. Some of the activity here is fairly “typical,” such as doors locking by themselves and faucets turning on of their own accord. What makes this restroom a little more unique is that the ghost who resides there is apparently a peeping tom who has frightened several women trying to use the facilities. Undoubtedly, this puts the hotel in a slight predicament, as there are not many women who would appreciate a desk clerk telling them that the person startling them in the bathroom is a ghost or a figment of their imagination. The next room that sees ghostly activity is the Cruise Room. It now houses Denver’s first post-Prohibition bar, which opened the day after passage of the 21st Amendment, which ended Prohibition in December 1933. As far as paranormal activity goes, it is reputed to be haunted by the ghost of an old man who comes to the bar to order a beer. Bartenders and patrons alike have witnessed the man drink his beer and continuously mutter about getting presents to children. When the man leaves and the bartender goes to pick up his empty glass, however, he always finds it full again. He is supposedly the ghost of a mailman who was going to deliver Christmas presents to children in Central City in the early 1900s, but he never arrived, and people assumed he had stolen the gifts. His partially frozen and decomposed body, however, was found in Central City with the presents still with him near the end of winter. One of the more mystifying and scary areas of the Oxford Hotel is its attic. It used to be a hot spot for ghost tours but now the hotel uses it for storage, and customers are no longer allowed into it. Some say it is one of the more eerie of the haunted locations in the building, and it has been the subject of paranormal investigations in which people claim to have recorded voices. Some employees will not go up into the attic alone because of the creepy vibes they get there. There have also been reports of objects stored there moving by themselves and the distinct sounds of footsteps behind people when it is obvious no one else is there. The last of the haunted locations in the Oxford Hotel is room 320. About half of the stories about it say that a woman named Florence Richardson was staying in the hotel with her husband one night in 1898 when she decided to kill him and then turn the gun on herself. Guest have reported waking up to an apparition of a male figure at the foot of the bed yelling about corrupting his wife. Reportedly this has caused several of the men to leave the room, and in turn the hotel, immediately. Other accounts report the bathroom light turning on and off very quickly and feeling a depression in the bed next to the guest as if someone were lying down. Room 320 has been called the Murder Room and is one of the most requested in the hotel. Like the attic, it has also had many paranormal investigators visit it. The hotel currently no longer advertises itself as a haunted hotel and has stopped giving haunted tours, although CBS did rate it as one of the top haunted tours in 2012. The hotel may no longer present itself as a haunted getaway, but customers still flock to room 320 and the rest of the site, hoping to catch a glimpse of past lodgers who never left. Is The Navarre, a Former Denver Brothel, Haunted? The Navarre building, which is now a museum, used to house a brothel. Its location directly across the street from one of Denver’s most prestigious hotels caused some problems for businessmen who did not want to be seen going from one place to the other. Tunnels underneath the buildings helped to solve that problem. Bar brawls and loose women are indelibly part of the history of the Old West, and Denver, once established, had its red-light district too. Some of these brothels became connected to expensive hotels via an intricate underground tunnel system that was built beneath the Mile High City, as its wealthy citizens did not want to be seen coming and going from such establishments. Rumor has it that these passageways were put to further use during Prohibition, and many businesses used them to transport liquor and sometimes trade it with brothels. 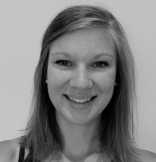 Kailyn Lamb, author of Ghosthunting Colorado, shares with us the story of one of these brothels, The Navarre. The Navarre was originally built as a school for girls in 1880 and was called the Brinker Collegiate Institute. While originally it served only women, it soon became a coed institution. After the death of the school’s namesake in 1889, the building was sold and reopened as Hotel Richelieu, a more infamous type of establishment. Here, gentlemen could dine with ladies of the night, either publicly or in more private areas of the building. There was a potential pool of clients just across the street at the Brown Palace Hotel, but business did not take off quite as quickly as the owners of the Richelieu might have hoped. As noted, to be seen coming to and from the Richelieu from the Brown was not ideal for a gentleman, so the idea for the tunnel system was born. The first tunnel connecting the basement of the Brown to the Hotel Richelieu was constructed around 1892. Later, a whole system of tunnels would spread underneath Denver, connecting other hotels—and even the government buildings of the city—to the whorehouses. Today, buildings can tap into the tunnels for hot or cold air, an unlikely heating and cooling system that is sold by the city of Denver. Bryan Bonner and Matthew Baxter of the Rocky Mountain Paranormal Research Society (RMPRS) said that, due to movement of air, the tunnels can make a plethora of ghostlike sounds. They also said that, unfortunately, some of the tunnels are too dangerous to enter, and many have been closed down or sealed. With the help of the tunnels, the Richelieu became the second-best brothel in the city, after Mattie’s House of Mirrors—which, incidentally, is also considered to be haunted. Many of the ghosts believed to reside in the building (now called The Navarre), predominantly on the second floor, are said to be those of the working girls. Bonner said that on one of RMPRS’s ghost tours, a guest allegedly saw someone pull back a curtain while the group was standing in front of The Navarre. 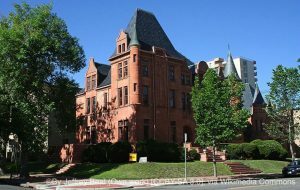 He said it was unlikely anyone was working in the building at the time, as it is now the home of the American Museum of Western Art—the Anschutz Collection. As all of the RMPRS tours are done at night and after business hours for the museum, only security personnel should have been in the building and, according to Bonner, they never leave their posts. His theory is that the mysterious figure who pulled back the curtain may have been the ghost of a working girl. The building continued to be used as a brothel until the early 1900s, when it became home to a different kind of discouraged business: gambling. In fact, the building’s current name, The Navarre, came about after the building was lost in a card game. The new owner named the building for a French king. One of the building’s ghost stories is that of a man who was not gambling well one night and decided to pull his gun and shoot himself in the chest for everyone to see. It is said that visitors can hear him wandering the halls on the lower floor. After the city began clearing out gambling halls and brothels, the building became a fine restaurant and eventually a top jazz club in the city. It was purchased in 1997 by the Anschutz Corporation. Regardless of who owns it, however, the RMPRS leaders say it is a good idea to keep an eye on The Navarre, as it currently seems to have a lot of ghostly activity happening inside. 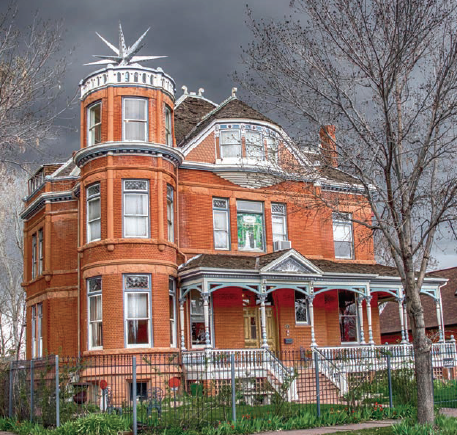 Kailyn Lamb, author of Ghosthunting Colorado, takes us on a tour of the Croke-Patterson Mansion in Denver. Thomas B. Croke was a teacher from Wisconsin who came to Denver and made his fortune as a businessman. From the beginning, Croke-Patterson Mansion had a reputation. A basic Internet search on the house brings up several websites that tell a “legendary” tale of how Croke was not able to spend even one day in his new home because something felt wrong about it. Real estate records reveal, however, that Croke lived in the house for six months, and the real culprit for his vacating the mansion was more likely the crash of the silver market. In addition, Croke’s wife passed away before the home’s completion, leaving him a widower as well as a single parent. Croke’s parents also joined him in the house, but his mother died shortly after moving in. Records and letters show that Croke later traded the house for land that was owned by Thomas Patterson. Patterson was a US Senator for the state of Colorado, who had previously served in the United States House of Representatives. Patterson was also the owner of the Rocky Mountain News, Colorado’s first newspaper. He lived in the house with his wife, Katherine, and daughters Mary and Margaret. Patterson also had a son, James, who had committed suicide in California before the family moved into the house. Mary died of chronic illness in 1894; after the death of his wife in 1902, Patterson deeded the house to his daughter Margaret and her husband, Richard C. Campbell. Patterson lived in the house a total of 23 years, until his death in July 1916. The Campbells continued to live in the mansion until 1924, the longest any single family ever did. The Campbells sold the house to the Louise Realty Company. Before becoming home to another family, the mansion changed hands and functions several times. However, the next family to live in the Croke-Patterson Mansion is frequently skipped over in online accounts of its history. Dr. Archer Sudan purchased and moved into the house in 1947. His wife, Tulleen, who was a nurse, accompanied him. They had a son, Archer Jr., who did not live with them in the mansion, as he was old enough to live on his own at the time. Although Tulleen was said to be happy and social, she committed suicide in one of the bathrooms of the house in 1950 using cyanogas, a powerful pesticide. It was rumored that the reason behind her suicide was that she had a miscarriage. What is most surprising about these residents being excluded from most written histories of the house is that it is the supposed ghost of Tulleen Sudan that permeates most of the tales. A woman who lost her baby, looking longingly out the third-floor window; the sounds of a crying baby when no one is in the house; and the supposed burial of a baby in the basement are among the accounts related to her. There is also a rumor that the baby was murdered. Tulleen, however, was 47 when she died, past the age of healthy childbearing, and there is no record of a child being born in the house. Some people who have entered the house even claim that they begin to feel as if they cannot breathe when walking up the stairs to the third floor. Cyanogas creates cyanide when combined with moisture, effectively suffocating anyone close enough to be exposed to the gas. Supposedly, Tulleen used a bathtub full of water, creating the cyanide to kill herself. Dr. Sudan continued to live in the house until 1958. After he and his second wife moved out of the house, Archer Jr. moved into the mansion, serving as landlord for the separate apartments his father had created upon moving in. Records show it was sold in October 1972. Many of the stories of apparitions point to Tulleen’s spirit having never left the house after her death. But there is more to the story of the mansion. History major Mary Rae and her husband became the next owners in April 1973, saving it from demolition and later helping to make it a historic landmark. In the late ’70s, the building was renovated to become an office space. Construction workers would leave for the night, only to come back the next day and find all their previous day’s work undone. Suspecting that people, and not ghosts, were behind it, workers put a fence around the building, and when that did not work they brought in a guard, who quit after one night. Next, guard dogs were brought in to protect the work site. There are multiple accounts of what happened next, but they all agree on one thing: One of the dogs jumped from a tower window in the building on the first night and died of his injuries within several days. According to other versions of the story, another one was also mortally injured on the second night. The other guard dog was found in the basement in a catatonic state, in which he remained for the rest of his life. Despite these setbacks, the office space was eventually completed, but the hauntings did not stop, and employees would hear typewriters and other office supplies being used when there was no one around. Many tied this to Thomas Patterson, saying that some scandal or story had not made it into the paper, so a departed Patterson was going to do it himself. One person, who owned the building in 1998, claims to have seen ghosts and witnessed household items move on their own. One resident of the building in 2004 claims to have seen apparitions of a maid who would go up and down the stairs, with only her upper body and torso visible and her legs seeming to dissipate. There is also a story of the ghost of Katherine Patterson helping a pregnant resident roll over. 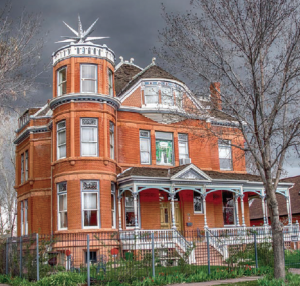 Rocky Mountain Paranormal Research Society (RMPRS) has worked with the current and previous owners of the building, such as Dr. Douglas Ikeler and his wife, Melodee. Bryan Bonner of RMPRS says that he heard the story of the pregnant woman firsthand from Melodee, who lived in the mansion with her husband for 10 years. Bonner added that, including the owners he has personally worked with, anyone who has been in contact with the mansion for long periods of time seems to start to “lose it.” He used Tulleen Sudan as a prime example. RMPRS also did a radio show out of the mansion during one of the periods it was vacant. Its members decided they were going to stay the night there for the show. One of the sound engineers stayed in the basement. According to Bonner, he came back upstairs immediately, saying there was a man standing in the corner. They searched the mansion but could not find a man. Bonner added, however, that it was the same corner of the basement where the catatonic dog was found, and it was the same corner in which the Ikelers’ daughters had previously claimed to have seen a man standing by their toys. The house remained vacant for a while before its most current owner, Brian Higgins, and his business partner at the time, Travis McAfoos, purchased the building in hopes of turning it into a bed-and-breakfast. Higgins decided to film the renovations on the building, documenting his own “hauntings” and mishaps that occurred while the work was in progress. After an 18-month renovation, the mansion was reopened in August 2012 as the Patterson Bed and Breakfast. Since then, it landed on CBS’s top 10 bed-and-breakfasts list in July 2014. With nine themed rooms and accommodations such as large flat-screen TVs, Higgins has worked hard to erase the stigma surrounding the Croke-Patterson Mansion. He renovated it for the modern world but kept some of the historical Victorian-era design, such as the mansion’s famed stained-glass windows. For the cost of spending a night there, paranormal enthusiasts can decide for themselves whether the mansion is still haunted. Kailyn Lamb, author of Ghosthunting Colorado, looks at locations throughout the state and dives headfirst into the history behind the ghosts and what has made them stay. Join her investigation of Mattie’s House of Mirrors. One of the busiest bars in the lower downtown area of Denver was once home to one of the city’s more popular brothels, Mattie’s House of Mirrors. 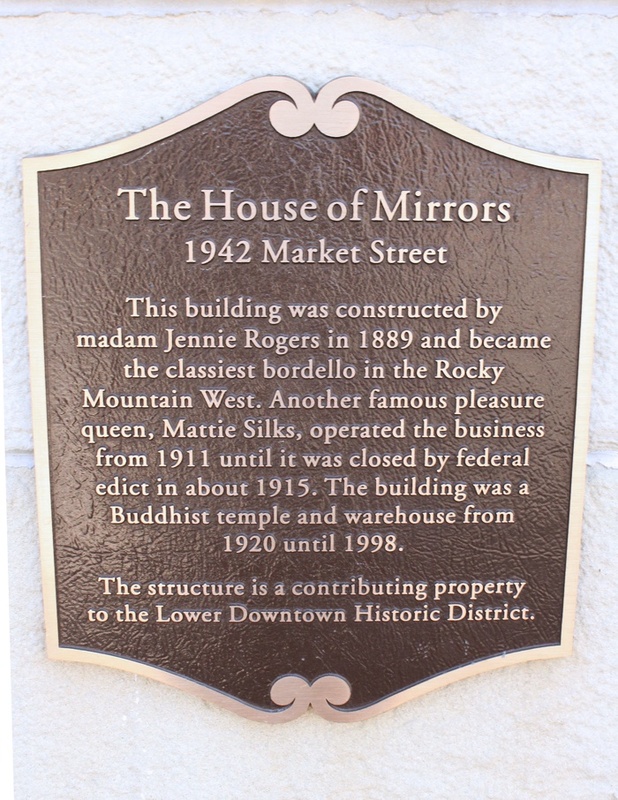 The House of Mirrors was built in 1889 by Jennie Rogers, whose primary objective was to compete with the brothel owned by Mattie Silks. When the building first opened, it was located on Holladay Street; in the late 1880s to early 1890s, the street would later be called Market Street. In 1894, before Rogers opened for business, brothel owners were shaking in their boots due to the murders of three prostitutes on Market Street, which became known as Strangler’s Row as a result. Silks took over the business in 1910. Once she was in control of the building, she converted the lower floor into a respectable restaurant. The building gained its name the “House of Mirrors” because any and all space was covered in mirrors. The upstairs of the building was a little less family friendly than the restaurant. The Rocky Mountain Paranormal Research Society (RMPRS) investigated the building in 2000 due to the alleged activity reported there. While there are plenty of rumors about people who have died in the building, the RMPRS could only find the record for the death of one woman, Ella Wellington. She was at one point an owner of the building; however, in addition to that, she may have also been an accountant or working girl for the location. RMPRS could not determine the cause of her death. Some of the reports of ghostly activity come from the room in which Wellington died, but the activity is not limited to that room. Some activities that have been reported are the piano playing by itself, the elevator moving between floors when it has not been called, and the smell of smoke in the bathrooms. Several people have also reported hearing parties when no one is in the building. Several staff members refuse to go to the upstairs area of Mattie’s alone. During this investigation, the researchers were able to pick up what sounded like a conversation between two voices in a corner. The recorded conversation can be found on the RMPRS website. The building now houses a bar called LoDo’s. 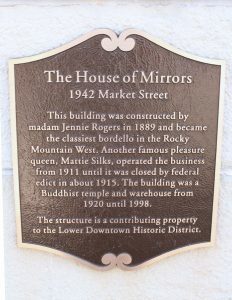 It is no longer covered in mirrors, but a plaque can be seen on the front of the building commemorating Mattie Silks and her House of Mirrors.